But unless you are chronically ill, it is hard to really understand what the minute-to-minute hardships are, how hard it is to find reasons to keep fighting, what it takes to “do life” daily, how much you want to work, why you are jealous of simple things like running, how devastating it is not to be able to care for your children, what it’s like to be disabled, how anxious one feels living with a time bomb body, how sad it is to be severely limited, why you can’t plan your day with an unreliable body, how one learns to live through pain, why it’s easier to have a “healthy person” persona, how hard it is to not have a single night of restorative sleep, what it feels like to know there is no relief, how it feels to know that you will be sick for as long as you are alive. And what it’s like to long for a day of feeling well. Just one day. 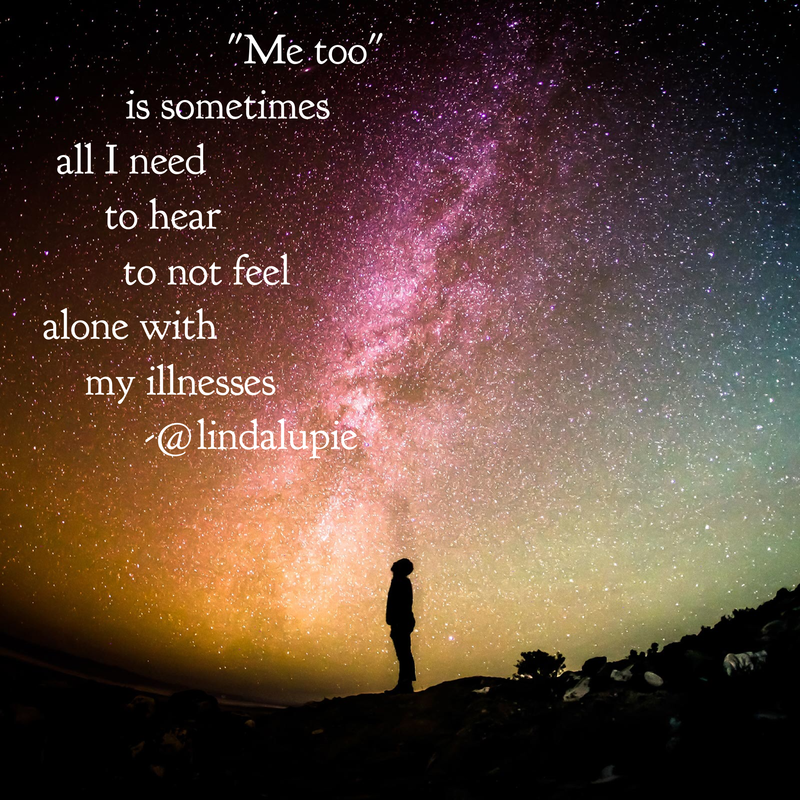 So on especially difficult days, when I share these thoughts with in-person and online fellow spoonies, the “me too”s I hear makes me feel understood, validated and less lonely. And for this, I am grateful. You just made my day! Thank you for putting my feelings on paper. I’m going to share this with my husband and friends. I’ve met so many other spoonies online and it does help to have someone else understand what you are going through. No matter how hard my husband tries to understand, he can’t. I appreciate his efforts, but will never be able to fully understand how I struggle with everyday events. Yes, I feel like I no longer even try to make non-sick person understand what I am going through. I share enough to raise awareness but they will never understand. Not because they don’t try but just because it’s impossible to really get it. I mean, sometimes the nonflare day me has a hard time understanding the flare day me!